CHARLES LATIBEAUDIERE: And we’re still rolling. EVAN ROSENBLUM: –with Charles Latibeaudiere! What up? CHARLES LATIBEAUDIERE: That’s right. Now we have to say Hall of Famer Terrell Owens. EVAN ROSENBLUM: Hall of Famer Terrell Owens played in a flag football game this weekend and tore it up. Killed everybody. I guess that’s what you expect of Hall of Famer. It was the Athletes Versus Cancer Game. 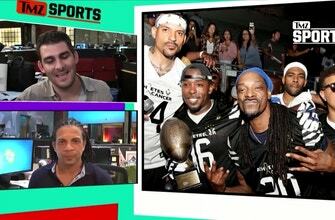 Matt Barnes and Snoop Dogg team up to do this event every single year. It’s awesome. CHARLES LATIBEAUDIERE: But it was good enough. EVAN ROSENBLUM: –put it on display at this game. Here’s how the game ended, with a Hail Mary in the back of the end zone to a Hall of Fame Terrell Owens. Watch this. EVAN ROSENBLUM: –in full yellow leggings. CHARLES LATIBEAUDIERE: Of course in the yellow leggings also. Listen, man, when you invite– this is why you have guys like Terrell Owens going out when you’re doing charity events, because this is what the fans want to see, right? EVAN ROSENBLUM: Look at this. CHARLES LATIBEAUDIERE: –out on a field, on a track. He is just awesome, still. CHARLES LATIBEAUDIERE: I got to say, for the other celebrities there, when you show up it’s a charity event so you want to show up and you want to do your part. But then when you see Terrell show up, you’re like, great, who’s going to cover him? EVAN ROSENBLUM: That’s an incredible throw, though. I mean, the throw is 60 yards. CHARLES LATIBEAUDIERE: Kerry Rhodes! Who knew? EVAN ROSENBLUM: That was like a perfect Hail Mary throw. CHARLES LATIBEAUDIERE: Kerry Rhodes was wasting his time on defense all the time. EVAN ROSENBLUM: By the way, that wasn’t even the most impressive grab. That goes, in my opinion, to JaVale McGee, the NBA star. He’s seven-feet tall. There was a play where he was run in the back of the end zone, and the quarterback dropped back and threw a high pass. CHARLES LATIBEAUDIERE: Helps to be seven feet. EVAN ROSENBLUM: –to go over the top. Watch him go up and over. No one’s even come close to that. CHARLES LATIBEAUDIERE: Up and over? Evan, he went like six inches off the ground! That’s it! When you’re seven feet and everybody else around you is like six foot something, it’s pretty easy. EVAN ROSENBLUM: It reminds me of a couple of years ago at the same event. DeAndre Jordan was playing, and they threw him a bomb in the end zone, too. Watch DeAndre Jordan. It’s not even fair. It’s not even fair how much taller he is than everybody else. CHARLES LATIBEAUDIERE: They should run on their knees. I mean, let’s be honest, all right. Once the ball’s in the air, if you’re seven feet, get down on your knees. And then if you make the play, great. EVAN ROSENBLUM: Yeah. 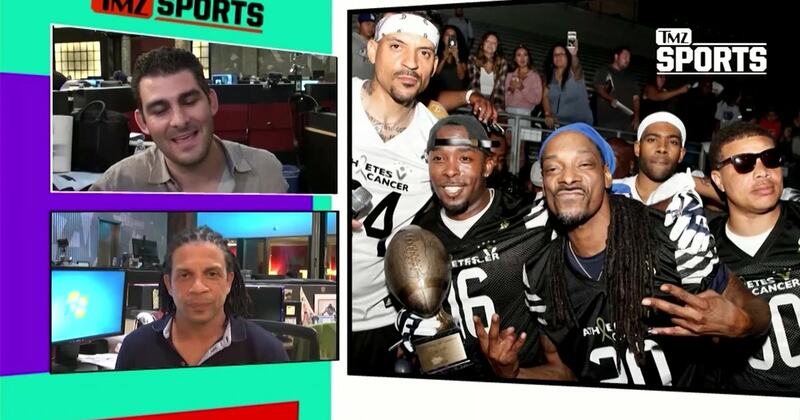 Snoop Dogg was there, Nick Young was there, Draymond Green was there. A bunch of celebrities. They raised a lot of money to fight cancer. Good for you guys. CHARLES LATIBEAUDIERE: Great for the cause. Really bad for your dignity if you’re the guy who has to cover them.